One fine day we encountered a strange error on the Enterprise Portal. 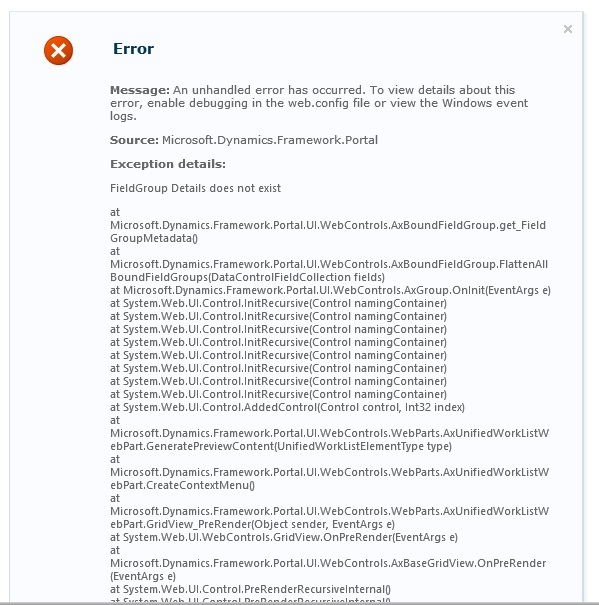 This error was flashed when the Approvals page was being displayed. Field Group Details does not exist. This error was quite specific that the system expects a field group called Details in some table but we were not sure where. Finally after a lot of hit and trial we found that the issue is with the way the EP approval page display is structured. The system expects that for any table participating in the workflow there should be a details field group designed. 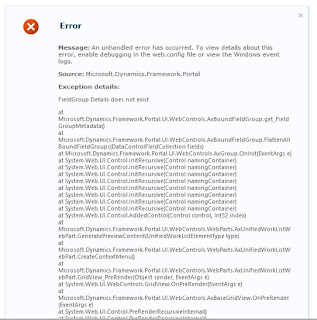 We started getting the above error once a new workflow was enabled for the user and the workflow involved a table (where the workflow status is maintained) which was missing a group called details. We added this group to the table and the page was up again.